Well it has been a while since I blogged. A combination of work, illness and DIY (disasters) has kept me quiet for a couple of weeks. I've only been out a couple of times but I've got my notebook full of the details so be prepared for a spot of retro-blogging over the next few days. Back with a BANG today! My good buddy Moore Patcher was off his patch and came over to mine for a trip to Hilbre. I had seen, from my desk with a little envy, the reports of the stuff blown in by the gales of the last few days and we fancied a piece of that particular pie! Weather was clear, cool and well windy! Still in the right direction for some good birds too! Text comes in: Leach's Petrels passing Wallasey beach heading our way. This quickens the pace across the windblown sands to the islands. The wind is in our faces but that adds to the fun for a while. Soon get a little tired of walking into it, but help is at hand, and we score a lift over in a rather worryingly corroded Land Rover. Down to the lifeboat slip and the birds come in thick and fast! What an experience, and that is what I'm after in my birding. Not a huge list of rarities, but watching good birds on the patch through the seasons. 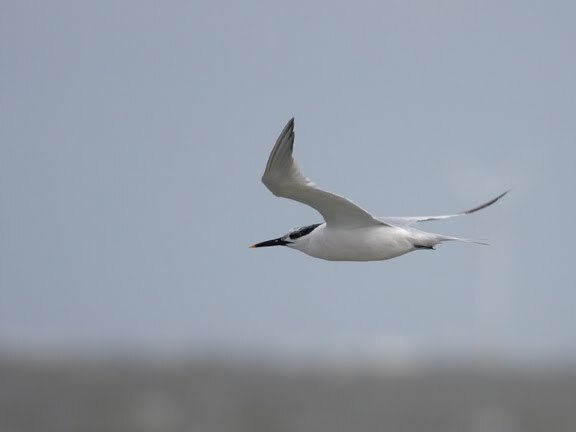 Terns and Cormorants pass, Oystercatchers are battling the wind as they circle the island. 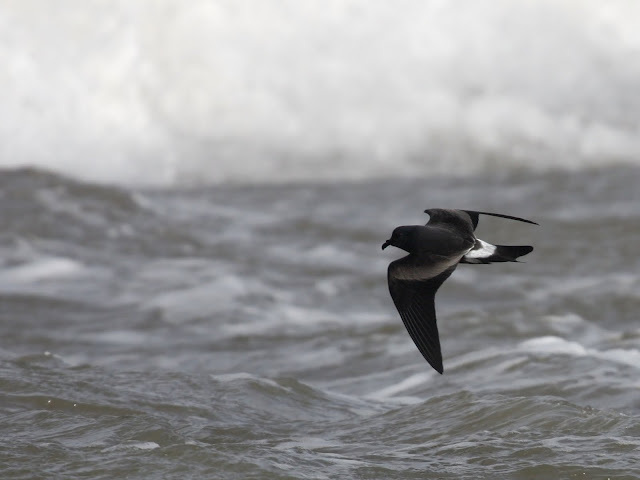 At this time of year with this wind we should see Leach's Petrels and possibly Sabine's Gull. Skuas and the odd Shearwater should put in an appearance too. Sure enough a Manx Shearwater comes swinging stiff-winged over the swell, managing to fly into the strong, gusty wind with the minimum of wingbeats. Not exactly effortless, but pretty close. Stuff is zooming around at great speed, dancing to the wind's deafening tune. I'm rubber-necking with all the action. I've made my way to the edge of the water, a bit of a risk with all my kit and the spray from the waves but it's worth taking. 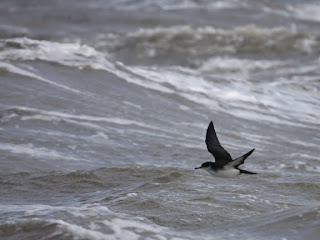 Guillemots are sat on the water, riding out the storm (on the way home we find one that didn't make it - a real shame). An Arctic Skua dives haphazzardly on a Leach' Petrel. That's our main quarry too. Leach's are an autumn classic on the Dee. I can't think of a better place in the country (world?) 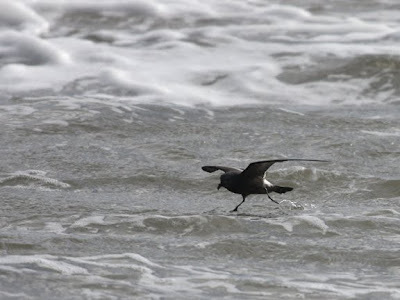 to see these cool little seabirds. We get cracking views of dozens of them. They come really close in and I bang off a lot of frames on the camera. 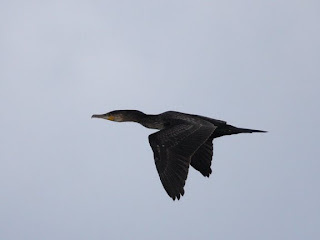 We meet another Dee watcher and the author of http://www.deeestuary.co.uk/ they are here for the petrels too. A chance to see them is not to be missed! Petrel-heads the lot of us! 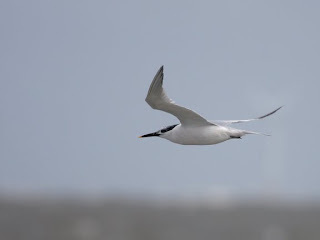 We follow a Sabine's Gull way off - a good spot! The Leach's keep on coming and we can see they are not just black and white birds, a smokey grey stripe sweeps across their wings meeting at the white rump. They are so close now you can see them pattering in the surf. What a treat! By this time I've filled 2 memory cards and flattened a camera battery, but we hang around for a while and have a poke about the old buildings, spot a few Bar-tailed Godwits and finally connect with a seal in the water. Job done we head back to West Kirby. It's an awful lot easier than the walk out, the wind at our backs speeds us back for a mammoth turkey, stuffing and cranberry butty.